1) Click on the "Turn ON" button for allowing credit card payments. 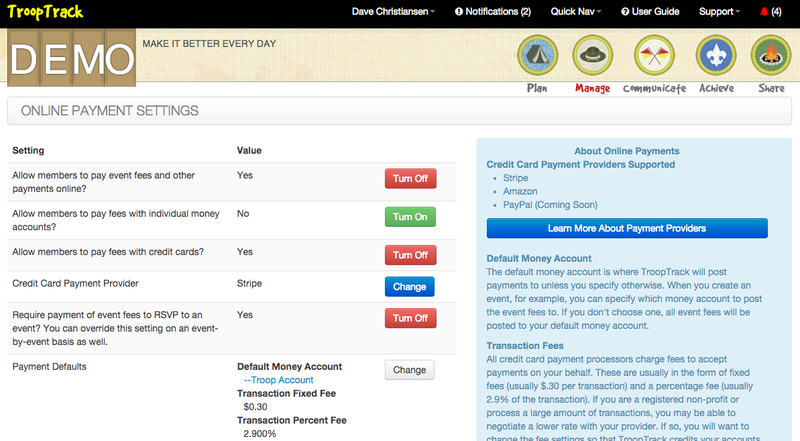 2) Click the "Change" button next to the Credit Card Provider setting. I recommend you also require payment to RSVP. You can override it for specific events, but it will make it easier to collect payment for events because members won't be able to RSVP without paying. When you create a more expensive event (like summer camp or high adventure) you can turn it off for just that event on the advanced tab of the event form. If you have turned on the setting to allow paying for events from individual money accounts you will need to turn that off. We'll update this feature so you can use both simultaneously soon, but in the meantime you can only choose one. 1) You will see two transactions for each payment in the account assigned to the event. The first will be a deposit for the total amount of the payment. The second will be a debit for the total amount of the credit card processing fees. 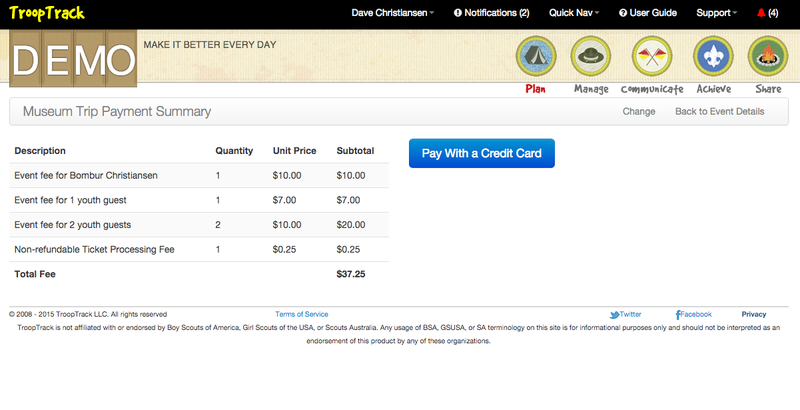 2) TroopTrack adds a 25 cent fee to each payment. This fee is non-refundable.